A new series of low insertion loss repeatability electromechanical switches exhibit low insertion loss repeatability guaranteed over millions of switching cycles. This performance is extremely useful to help maintain overall system measurement accuracy. Typical applications for these switches include test instrumentation, research and development, electronic countermeasures, electronic warfare, microwave radio, space systems, and radar. These 12 electromechanical switches exhibit extremely low insertion loss repeatability with guaranteed levels of 0.03 to 0.05 dB over 5 to 10 million switching cycles, depending on the model. Performance includes low insertion loss of 0.3 dB with high isolation of 100 dB typical, and input power ratings of up to 70W CW and up to 1W for hot switching applications. 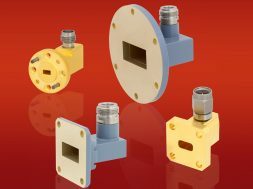 These switches cover broadband frequencies from DC to 40 GHz and are offered in three configurations: SPDT, SP4T, and SP6T. They have latching actuators and desirable features that include indicators, self-cut-off, and all models are export-rated as EAR99.